Yesterday, we received a message from AC / DC Administration in WeBoc`s inbox. According to the message now it’s mandatory for the trader to declare both “Unit Value (Self Assessed)” and “Unit Value (Invoice) and also some other changes will be implemented in the system w.e.f. 02.09.2015 so Below we reproduce the detail message that we received. Hyderabad/ Gawadar/ Quetta/ Lahore/ Multan/ Faisalabad/ Sialkot/ Islamabad/Peshawar. Kindly refer to the subject noted above. i) An additional text box has been given to importer / customs agent to declare invoice value for an item in addition to declared custom value. ii) System shall not allow user to enter declared unit value of an item lower than the entered invoice value. iii) System shall calculate duties and taxes on the basis of declared unit value (self assessed). iv) Declared invoice value of an item shall be visible in GD print in the column of declared value, so that importer may not face any problem if he submits GD to any other organization like banks, etc. However, assessed value shall also be visible on GD print. 2) This office appreciates the feedback received from the Collectorates for improvement of the WeBOC software. 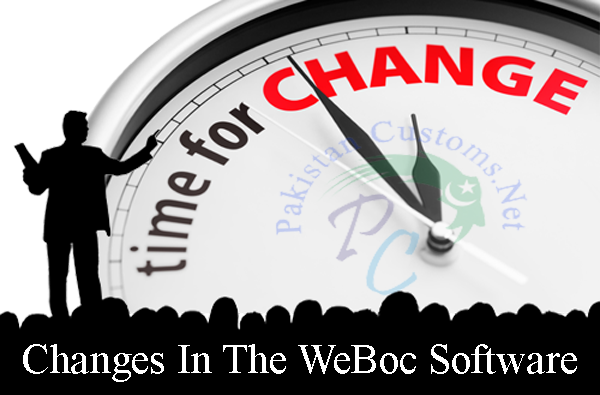 The support team may be contacted at support.weboc@pral.com.pk for any further assistance and support. Collectorates are requested to circulate the new changes to the stakeholders for information. 1. The Member (Customs), Federal Board of Revenue, Islamabad. 6. The Chief (R & A), Federal Board of Revenue, Islamabad. 7. The Chief Collector of Customs South (Appraisement/Enforcement), Custom House, Karachi. 8. The Chief Collector of Customs Central, Lahore. 9. The Chief Collector of Customs North, Islamabad. 10. The President, Karachi Customs Agents Association, Karachi. 11. The President, Shipping Agents Association, Karachi.